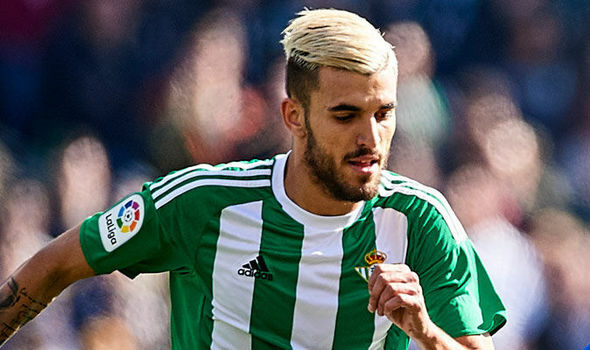 The Real Betis midfielder, 20, starred for Spain at the European Under-21 Championship and is now the centre of a transfer battle. Real Madrid want to bring him to the Bernabeu and will pay out his £13.2m buy-out clause to get a deal done. Spanish newspaper Marca say Ceballo himself is keen to join Real. But Barcelona have now entered the frame and Real Betis vice-president Lorenzo Serra Ferrer would prefer to see the midfielder join them. Ferrer spent a year in charge of Barca between 2000 and 2001 and is close to several key figures at the Nou Camp. He is said to still enjoy a close relationship with many Barca directors, having worked with them last week to secure the signing of Cristian Tello. Ferrer was about Barcelona’s interest in Ceballos this week and he confirmed there had been enquiries. Despite Barca’s interest, Real Madrid remain determined to get a deal done. Their general director Jose Angel Sanchez will reportedly meet with Real Betis shortly to try to convince them to change their mind. The Spanish giants aren’t the only ones interested, though. Juventus have also lodged an interest in the midfield maestro.